If we’re not careful, Melbourne and Sydney will become like London and Paris – places where the international super-rich grow their money while ordinary residents are priced out. My friend Roger and his partner inherited enough money to buy an Olympic Village house in Heidelberg West. Another couple I know purchased a three-bedroom house out in Belgrave with a $300,000 mortgage – despite being city kids at heart. A number of my colleagues are buying in towns over 50km outside of Melbourne like Woodend, Castlemaine or Ballarat – since they love the smalltown lifestyle, but also because that is where they can afford to raise their young families. But in the current housing market, these are the lucky few. For most people I know around my age or younger (I’m 42) the possibility of owning a home is barely even on the radar. The possibility of owning a place within 20km of the CBD is even more remote. These are not people who I would call poor or even working class. Most of them have steady incomes and work in full time creative or professional positions. In Melbourne we have just seen the September house values peak above records previously set during the 2010 housing boom. Buoyed by low interest rates, buyers are surging back into the market, delivering a 5% rise in prices in Melbourne over the past quarter. That means prospective smart investors can expect an annual return of around 10% or higher. But the question is, who are these buyers? What we are now witnessing is a trend that is occurring in major cities globally including London, New York and Paris. Major, thriving cosmopolitan international cities like ours are becoming global capital reserve shelters. Such cities in relatively prosperous economies are in danger of becoming places where the world’s richest people can safely park their money and sit back to watch it grow at a staggering rate. 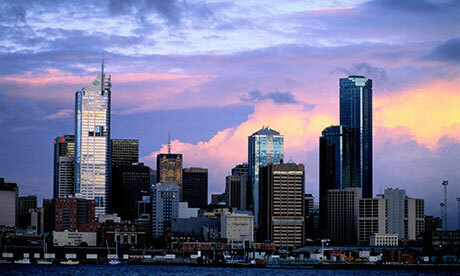 Globally speaking, housing in Melbourne and Sydney make a pretty safe investment – with fast returns almost guaranteed. Meanwhile, the gap between our capital city prices and those of rural areas continues to grow as we embrace an urbanised international economy. The downsides for local people are stark and sobering. Where I live in St Kilda, entire streets such as Inkerman Street and the top of Fitzroy and Barkly Streets have become medium density “off-the-plan” investment property strips, with shiny new towers popping up like mushrooms in the morning sun. Meanwhile the character of the area is changing from one of art-deco seaside charm to shiny, prosperous urban living. The ripple effects for those of us that live and work here are felt at many levels. The general cost of living shifts upwards to meet the new investor demographic. Increased property prices mean increased living costs generally – café prices go up, theatre and cinema tickets, groceries. Our open community spaces are increasingly perilous as commercial interests covet every square acre of land. Clearly Melbourne needs higher density planning for environmental, public transport and infrastructure reasons. But these developments are not offering affordable housing or in any way contributing to building diverse communities. They are being sold as mostly one or two-bedroom “off-the-plan” investment properties for rich local and, increasingly, international investors. Meanwhile, rather than providing affordable housing or support for those struggling in the top-heavy housing market, in Australia it is high income earners that are the overwhelming beneficiaries of government housing support. A new report from the Grattan Institute, Renovating Housing Policy, has found that Australian homeowners received $36bn a year in government subsidies, landlords about $7bn and renters less than $3bn. In other words, government policy settings are geared toward helping the rich shore up their investments, while those locked out of the market altogether are left in the outer. The small amount of tax foreign property investors pay mean government coffers for schools, medical centres, low-income housing, and community services is increasingly stretched. These days it’s not just the poor that are being squeezed out, but an entire generation of young and middle aged Australians – many of them professional working people trying to build families and careers. In the worst-case scenario our cities cease to be unique places of urban living and become soulless places of fleeting investor transience – accessible only to an international elite who wish to do business here or merely hold onto a stake of it until it can be sold to the next higher bidder; a commodified housing market place where people no longer search for a place to live so much as merely a good investment opportunity. Australian cities need to aim higher than that. Poor expression – “Meanwhile, the gap between our capital city prices and those of rural areas continues to grow as we embrace an urbanised international economy.” What does this sentence mean?